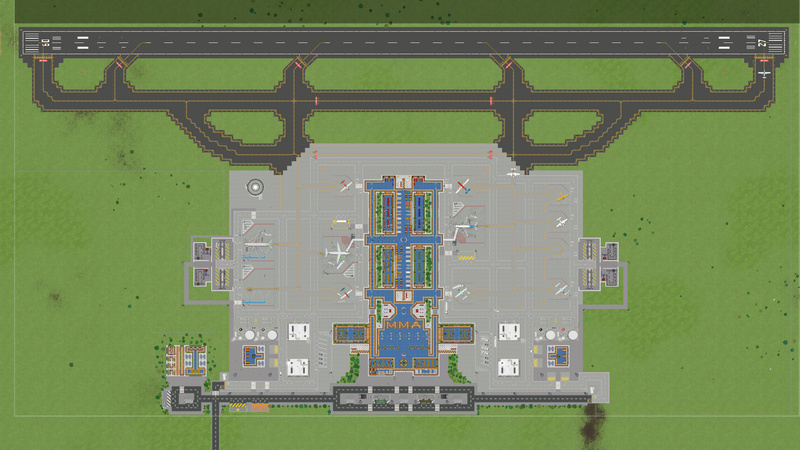 Good evening airport CEO and a warm, warm welcome to this week’s development blog! Another two weeks has passed and we have as a result of that some good progress to share with you! Fredrik is back after tending to his new-born son and while he was away, we deployed Alpha 30 to the default branch containing the soundtrack update, a new interactive tutorial panel and heaps of bug fixes and improvements. And because of that we of course do not have any time to spend on this introduction which is why it stops here. This last Thursday we finally deployed Alpha 30 and The Soundtrack Update to the default branch. It’d been cooking for quite a while on the experimental branch as we wanted to make sure that we wouldn’t get the same kind of bug influx as a result of Alpha 29 and while there weren’t any immediate fundamental system changes with this update (except for audio which is not critical to the simulation) it seems to have paid off as the number of game breaking reported bugs are noticeably fewer than after the default deployment of Alpha 29. Grab your travel tickets while they're hot! And while a large part of Alpha 30 was indeed continued bug fixing and stabilization, the point of the update was of course the soundtrack itself. 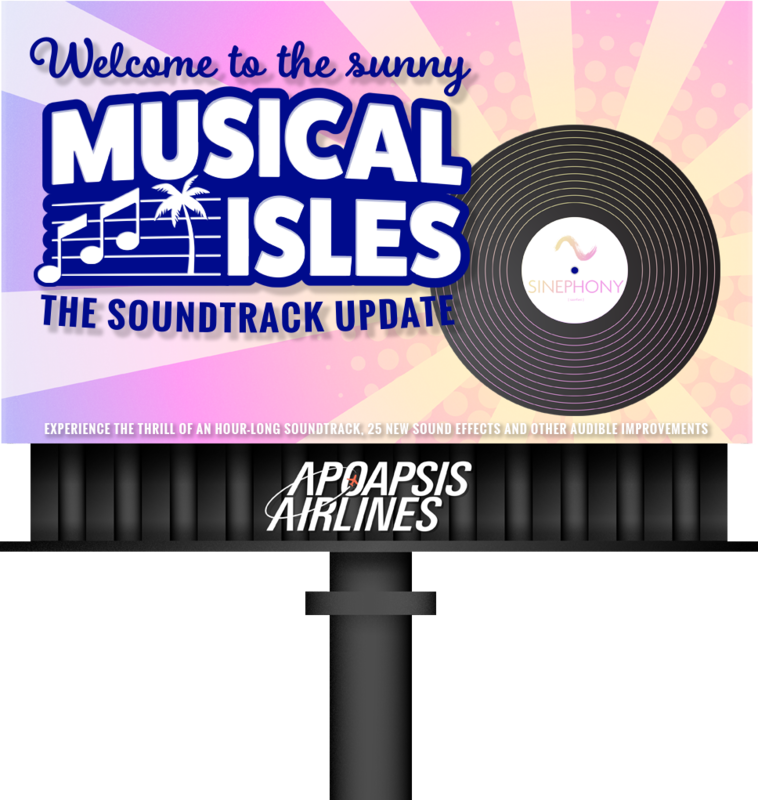 It offers an equally comforting and thrilling musical experience, guiding you through the many stages of managing and expanding your airport. The nine tracks covering a full hour of original music, takes you from the familiar origins of jazz and lounge inspired tycoon music, to more unusual territories with sounds influenced by various musical genres such as funk, rock, electronic and techno. The soundtrack was composed and produced by Daniel Rosenqvist and Anton Dromberg of Sinephony, a Stockholm-based studio specialized on music production for games. Together with us they've spent the past year realizing the soundtrack dream taking it from idea to composition, recording and eventually mixing and mastering. The soundtrack was mixed with the guidance of Willem Bleeker of Baggpipe Studios and mastered by Johannes Ahlberg of Saintpid Mastering. A total of 10 talented musicians participated in the recording of the soundtrack playing everything from brass instruments to strings and we would like to extend one final international airport sized thank you those musicians, and especially Daniel and Anton of Sinephony for creating this gem of a soundtrack. If you still have not checked out what the soundtrack update is all about, then here's another and perhaps final chance as advertised by us: The behind-the-scenes short trailer movie from when the soundtrack was recorded! Looking forward with Alpha 30 deployed we will now make some small adjustments to the development strategy. While we’ve spent a lot of time working on multiple floors and localization the past few weeks bug solving have still very much been the main priority. However, at this point we will now make a slight shift and prioritize new development to get the overall game development going and the state of the game moving forward. We’ve previously spent around four to three days per working week solely towards bug solving development, but will from this point on and forward reduce that to two days and work on new stuff the rest of the week. Those two days will be devoted to single critical bug reports or bug reports that together form a pattern, however some of the new development will cover improvement of systems and game design aspects that today may be the source of certain bugs or inherent design flaws unknow to a player. This will cause the daily updates to the experimental branch to drop to around once or twice per week and as always you can follow everything we do via the public trello board! Alpha 30.1-5 has just been deployed on the experimental branch with some queue and audio fixes and will be followed by Alpha 30.1-6 tomorrow containing additional remote stand and other operation related improvements. The office whiteboard to the right is shown in its rough, uncut state. Nothing here is final or should be considered definitive but we just wanted to share some none-code aspects of the workings of this project. Busy Friday with a lot of branch activity going on, too busy to care about spelling... then again, who cares about git commit messages? 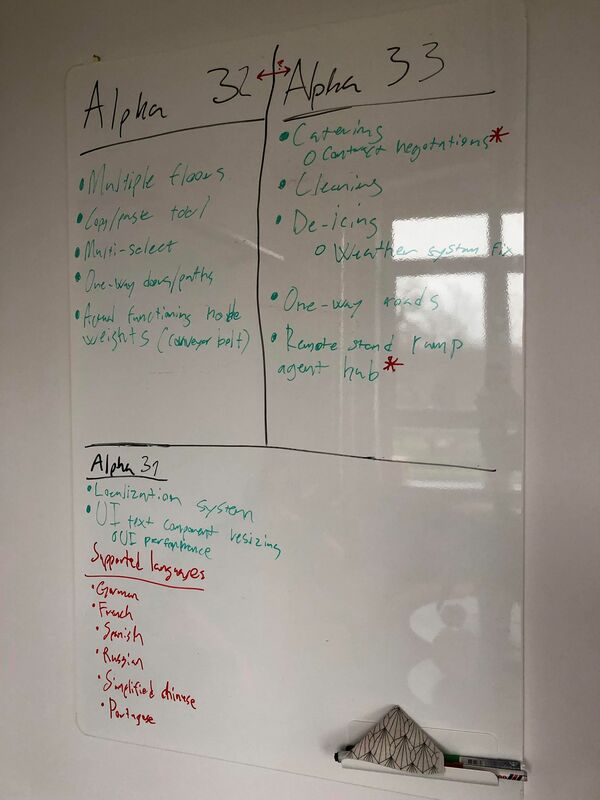 The plan for Alpha 31, 32 and 33 has however laid out. Alpha 31 will most likely consist of the localization system enabling Airport CEO to be experienced in new languages. Shortly after that Alpha 32 will follow and either contain multiple floors and all surrounding that including some tools for better controlling passenger flows, or the three new turnaround services as voted on by the community including various other improvements such as a refined weather system and one-way roads. This depends on whatever feature gets completed first and stable enough for experimental and default deployment. We will provide greater details to the updates and their respective statuses ahead as things unfold! As mentioned above, we’ve made good progress on multiple floors over the last two weeks. The building system adaptions are more or less complete except for some visual polish on representing certain level views such as the roof view. We’ve therefor as of last week started working, step by step, on converting each agent’s path finding algorithm to the concept of an upper and lower dimension. This has also progressed well and since we usually write long essays on what exactly has been progressing, this time we thought we'd hit you with a picture bomb instead and keep the stories for another time. Please note that visuals are not final! Initial vehicle world entrance path replaced with an underground tunnel. That very same tunnel continuing underground. Check-in desks connecting immediately to the underground world. Underground view of the active conveyor belt system connection including some road and foundation testing. Underground sorting area and some other random testing. What’s left now is to dig into the employee and passenger path finding and overall AI behavior and of course, visual polish. We’ve been developing stairs, escalators and elevators throughout the past week together with Mitchell we will continue throughout this week. We’re expecting to run initial tests of the multiple floor building system on the internal branch by the end of this week. … there was another aircraft vote completed the next light non-GA aircraft to be implemented will be the Beechcraft 1900D! Steve can’t wait to get his hands on the production. … and speaking of aircraft, the finished 787 is currently seeing a lot of liveries implemented as we’ve gone further ahead with the implementation of the first large aircraft. Since large aircraft and everything surrounding those are scheduled for implementation shortly after Alpha 33 we’re already now preparing for the first large aircraft models that’ll be a part of that update. … we’re as mentioned in a previous dev blog heading to Reboot Blue in the midst of April. Let us know if you’re there and want to catch up! … nothing else! We're sticking to putting hours into development, well except for this little bi-weekly essay. Looking forward to deliver more updates on feature implementation progress being made in the next dev blog and until then… fly safe!